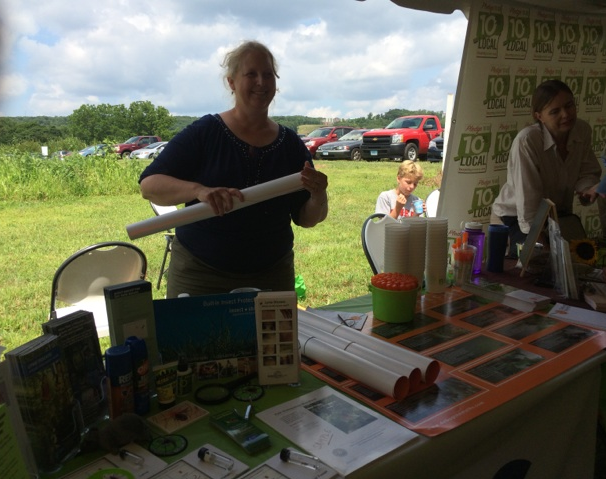 This week, we teamed up with Lyme Connection, a community-based organization offering BLAST tick-borne disease prevention programming, to talk with residents in Connecticut about creating a safe, pest-free outdoor environment at Plant Science Day. The free, public event, hosted by the Connecticut Agricultural Experiment Station (CAES) at Lockwood Farm in Hamden, Conn., supports awareness around the importance of maintaining healthy outdoor spaces. We handed out educational materials, including a flier about the importance of safely eradicating unwanted insects and plants such as ticks, mosquitoes, and poison ivy, and taught visitors to our booth how to identify these pests as the first defense against Lyme disease and West Nile virus. Our team members also talked to them about choosing the right product for the problem, and using it correctly by reading and following all label instructions. In addition, we passed out posters with the latest information on identifying common invasive species found in the Northeastern United States. For the youngsters in attendance, we shared a children’s book titled “What’s Bugging You?” by Raymond Bial that teaches kids about identifying common pests around their homes. The CAES is a non-profit organization that provides education, prevention, and support for plant science. It offers soil testing, plant and insect information, tick testing, mosquito surveillance, invasive aquatic plant information, and inspections and regulations. Join us in the conversation on Twitter @DebugtheMyths or on Facebook at facebook.com/DebugtheMyths using #BackyardBoss.